What makes the perfect vacation wardrobe? To us, it's about marrying ease with sophistication, packing one-and-done pieces that look stylish no matter how many days they've been scrunched in our suitcases. Marina Cortbawi has exactly the solution with her simple yet elegant clothing line, Merlette. "After travelling the world and meeting many different women and understanding their lifestyles and needs, I wanted to create a product for the niche I noticed was being underserved," Cortbawi says. "Desirable clothes of an attitude where style counts more than seasonally changing fashion." For the designer, that means feminine pieces that "can complement the luxury designer world in a comforting way." But even if jet-setting isn't on your agenda once winter arrives, there's still a place in your wardrobe for Merlette's dreamy designs. Says Cortbawi, "my idea is to develop garments that make a woman feel as desirable as she feels when she's on holiday." Read on to shop Merlette! This dreamy gown is begging to be worn on the beach. There's something delightfully festive about this bright blouse. 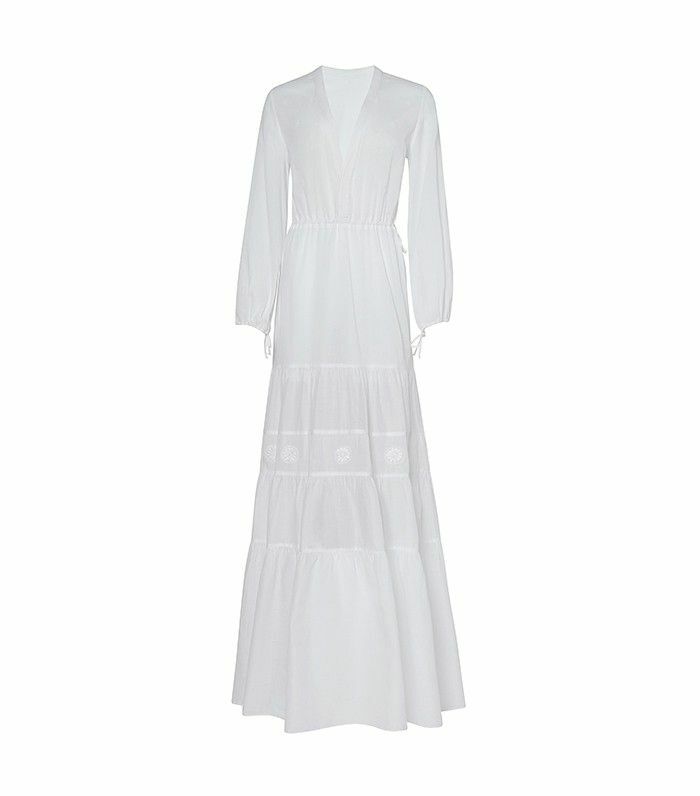 Style this dreamy dress with sandals for a beach day; then swap in heels at night. A little off the shoulder is a lot of fun. This drapey dress is pure perfection. Add oomph to your look with this eye-catching wrap top. A simple white crop top is the perfect wear-with-anything piece. A vacation look for the girl who wears all black, all the time. Statement sleeves make this blouse a must-have. Pair this skirt with a basic button-down, or amp things up with a statement top. Vacation style is all about keeping things simple, and this top fits the bill. Want more vacation inspiration? Here's how to step up your travel style!